This is the blog that accompanies the Epileptic Gibbon podcast music show. The Epileptic Gibbon is me, your guide in a world of weird, wonderful, epic, majestic, experimental and beautiful music. I’m also a psychologist/tutor (my main job) and a huge music fan, with the latter leading me to host my podcast show and also organise EppyFest, an annual one-day indoor music festival. My podcast music show is devoted to the best mixture of independent and small label (with occasional major label names) prog rock, art rock, post rock, prog metal, jazz rock, folk rock, math rock, downtempo, chill-out, ambient electronica, IDM, chamber pop, folktronica, psychedelia , neo-classical , film & TV soundtracks and experimental/avant garde music. The Epileptic Gibbon Podcast Music Show is licensed to podcast by the Performing Rights Society. just downloaded podcast #4. Nice job. Thanks for playing one of my tunes. I love this podcast … you have introduced me to a wonderful selection of new music ..
Here’s one for you … John Blackshaw …. look him up on iTunes…. he’s an amazing guitarist. Take care.. look forward to April! ‘Glad you like what Overvibe have to offer. There’s lots going on with this band – definitely one to watch for ’08/’09. Would like to invite you to review my music for consideration on your podcast. “click” on “artist” on homepage,then “audio”,there are nine ambient pieces and 16 songs on this album. If it fits your format and you would like a CD,I will send it to you. Feel free to check out Pocketful on myspace. Please let us know if you’re interested in including our music on your podcast. I have just discovered the Epileptic Gibbon podcast while chasing down an opportunity to see William D Drake live and finding Eppyfest. The ‘click here to listen’ link on each podcast page gives streaming audio only.You give the download file size so I assume podcast download is supported. However, I cannot see how to do this. Please forgive this stupid question. I am old and dim. 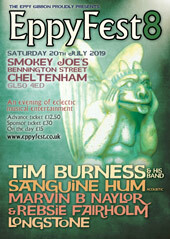 I find your name and the title of your “Eppy Fest” personally unfortunate but also distasteful to the many people with epilepsy who are my patients. They have enough stigmatisation to deal with as it is. You say you are a pschologist so you should know better. PS I had enough to cope with being called Funky Gibbon throughout my childhood but this takes the biscuit. Thank you for your comment. I am sorry to hear that you have been offended. It is worth noting that no offence is intended. The podcast show and the festival do not in any way denigrate the condition of epilepsy or people who suffer with it, any more than it denigrates gibbons or people with the name Gibbon. Hello Mr Gibbon. I have two questions… First is, are you a funky gibbon? (hope that is only the first time you’ve heard that today) and secondly, what is the best way for me to get my album to you to consider for your podcast etc? You can sus us out at http://spiralkey.bandcamp.com/. I just wanted to say thank you for playing my song, Ghost Town, on episode 113 of your show! Loving your podcasts and we would absolutely love the chance to have some of our music played on your show! If you like what you hear then send us an email to info@section-iv.com and we will happily send you over a promo code for a free download. Preston based three piece DEAD bring another slice of lo-fi, angular rock music for their second release Caturday (out 16/01/16). After a string of shows across 2015 supporting the likes of The Monobrows, Cunch, Ka-Ghoul and John Revolta, DEAD hit the studio to record 3 new tracks, including fan favourite We’ve (Still) Got A Ghost. Very sorry for the extreme delay, Scott. I like what I’m hearing. I’ll try to feature a track on a future edition of the show. Hi great show great music thank you. Many thanks for the feedback Paul. Really glad you’re enjoying the show. What sorts of music do you enjoy? And are there any tracks/bands/acts you’re particularly enjoying? I hope all is well with you. Excellent work with the show. If you’re interested I have a new piece of work being released on 1st August 2016. It’s out on Bandcamp where I have also put the rest of my catalogue. If you wouldn’t mind maybe giving some listeners the heads up about this I’d greatly appreciate it, I can send you links etc. if you would like a listen. Very sorry for the delay Damon. Just sent you a message on Facebook. First of all I listened to a more recent episode and I really enjoyed the show.. keep doing what you do. My band just released our first album. We put a lot of work into and we’re excited to share it with the world. Would you be willing to check it out and tell us what you think? If you like what your hear we’d be thrilled if you featured a song. It’s at bigmath.bandcamp.com shoot me an email if you’re interested? Thanks for your time. Keep it up man! Ahh I meant mr gibbon, not “Mike gibbon”! Haha how awkward. My oppolgies, gib master flex… I meant that one.